WILLEMSTAD - The blockades at entrance 5 and entrance 7 were lifted yesterday afternoon after the judge's order. The Refeneria Isla, Curoil and Aqualectra together filed a lawsuit against the union SGTK to free access to the oil refinery-terrain. The protesting workers employed through contractors on the oil refinery premises blocked the entrances to the refinery by burning tires and other things on the public road. The police had to close off the Schottegatweg and the Emancipation Boulevard as a precaution. 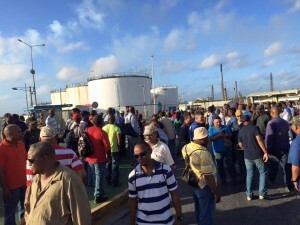 Because of these blockades the utility company Aqualectra was not able to enter the premises of the oil refinery where one of its main electricity plants is located. This resulted in a power outage in several neighborhoods yesterday. At the end of the afternoon, the blockades were lifted and the company was able to enter the refinery premises again, which normalized the situation. According to the government mediator, there is still no agreement between the parties. The parties were close to reaching a deal, but had to suspend the meeting to attend the lawsuit.